Kansui (枧水, jian shui), also called lye water or alkaline salt, is an alkaline solution that regulates acidity in the process of dough making. 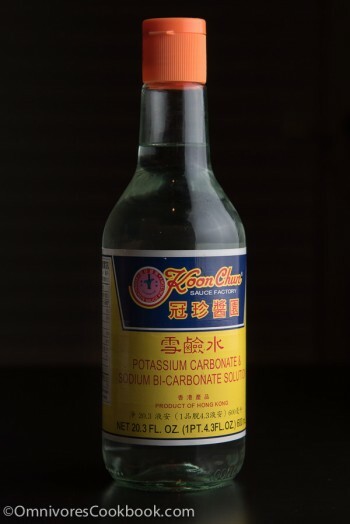 Chinese alkaline solution – It contains potassium carbonate and sodium bicarbonate (or baking soda). This solution is a key ingredient in traditional Cantonese mooncakes; it causes mooncake skin to have a dark golden color. Japanese alkaline solution – it contains 80% sodium carbonate and 20% potassium carbonate. It is the key ingredient in ramen making; it causes the noodles to have a yellow color and a special springy mouthfeel. Some Asian stores carry these products, but in most cases it’s very difficult to find them outside of Asia. For both varieties, the alkaline solution can be replaced by a homemade one made from two extremely common ingredients – baking soda and water. There are two approaches to making alkaline solution at home, one that uses baking soda and one that uses baked baking soda. However, baked baking soda is recommended for both mooncake and ramen making. There are two reasons to choose baked soda instead of baking soda. First, baking soda is difficult to dissolve in water. At a temperature of 18 degrees C (64 F), only 7.8 grams baking soda can dissolve into 100 milliliters of water. Second, baking soda is too mild in terms of pH to produce the necessary flavors and textures. When using a baking soda solution to make mooncake dough, it results in a mooncake that is quite pale in color. On the other hand, this problem can easily be remedied by using baked baking soda. In the baking process, sodium bicarbonate (the main ingredient in baking soda) transforms into sodium carbonate, giving you a stronger alkaline salt that is more soluble in water. Making baked baking soda is easy. Preheat oven to 250 degrees F (120 C). Line a baking tray with aluminium foil. Spread baking soda on the foil and bake for 1 hour. The baking soda will lose about one third of its weight and you’ll gain a stronger alkali. Do not touch it with your bare hands. It will cause irritation to sensitive skin. Transfer baked baking soda to an airtight jar to prevent it from absorbing moisture from the air. To make an alkaline solution for mooncakes, add 1 teaspoon baked baking soda to 4 teaspoons water; stir to mix well. Feeling uncomfortable about using an alkaline solution in food? If you feel reluctant to use an alkaline solution in your food, just consider that corn tortillas, hot chocolate, Oreo cookies, cured olives, and pretzels all have alkaline solutions introduced during their cooking processes to form their distinctive flavors and colors. To read more about baked soda, please refer to this article.